Timberline Ranch has always been a scenic escape from the daily grind of city life and respite for the soul. 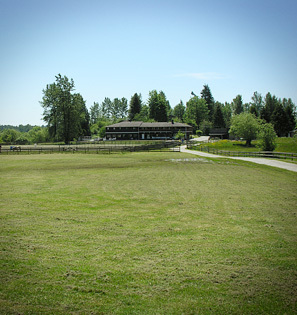 Two men, Cec “Chuck” Leng and Don “Lefty” Lawrie, had the vision of creating a ranch-style camp that exposed Vancouver youth to the Gospel. After searching for eight months, the pair found a 73-acre Arabian horse ranch in Maple Ridge they knew would serve God for years to come. After the land purchase in 1961, Chuck, Lefty, and their families lived on site training young people in the basics of Christian life in association with the Navigators. Timberline Ranch was registered as a non-profit society in 1964, and in 1967, Chuck wrapped up six years of work as director and board chair by handing the reins over to Peter “Rocky” Wittenberg. Rocky built, preached, and directed until 1984, at which point more than 800 campers were coming to summer camp at Timberline. Under his leadership, Timberline Ranch facilities and programs evolved: the lodge, bunkhouse, cabins, and a heated outdoor pool were built or improved to allow year-round use. Since 1984, a Board of Directors has shown the path for Timberline, with long-serving directors Frank Chisholm and Ron Hoskyn overseeing large projects like the construction of a new barn. Current director Craig Douglas has led the camp since 2005. Since then, the Ranch has developed numerous new activities and leadership training opportunities. The team has also built the Western Town, the Powerhouse, the Poolside Cabin additions, the Town Hall, the Horseman Inn, and significant improvements in the overall infrastructure of the Ranch, including a sewer system and burying the power lines. The facilities now accommodate over 200 people at a time, and over 10,000 young people come to the Ranch every year. Many groups come annually, and most groups book a year ahead to secure their place.